Today was really hot outside. There aren't too many of those kinds of day in the bay area, especially on the Pacific Ocean, because of the cold water. So what did we do? We decided to ditch the afternoon at Berkeley and go to the beach! 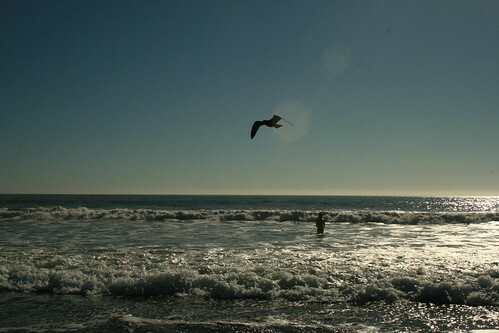 Our favorite beach is Stinson Beach because its so big and there is free parking. It also seems likes it the warmest there, probably because its somehow protected from wind. Its right on the San Andreas fault near Point Reyes. Our spot on the beach, complete with beach umbrella! 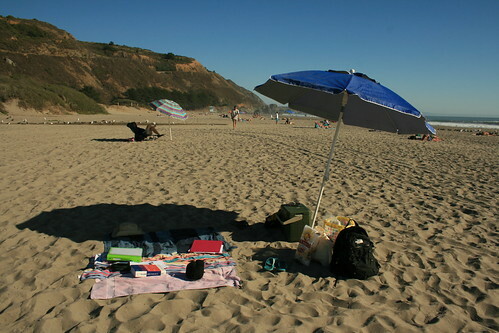 This was the first time that we actually brought a beach umbrella to the beach. The sun was really hot, so it was nice to have the umbrella. We found that umbrella on the street. Somebody was throwing it away because the stalk part of it was rusted and makes it hard to adjust the height. But we grabbed it when we saw it about a year ago, and its great! One man's trash is another's treasure. Romy went swimming in the cold water! There were a lot of sea gulls out. One of them was very interested in our bag of chips that we took with us. It was unopened, but the gull must of known what was inside. As soon as we stepped away from our towel, the sea gull went straight for the bag of chips. It decided to ram its beak into the bag and poke a hole into it. It did it with such force that it almost ripped the bag open entirely! We got back to the towels just in time to see it all go down, and chased the bird away. It stalked us for 10 minutes after that, waiting to go after the bag of chips again. It was very persistent, but eventually gave up. We saw a pair of dolphins swimming in the ocean near the shore! The dark spot in the water is a dorsal fin. As the sun was getting lower on the horizon, I was watching a surfer ride the waves. Then something else in the water caught my eye. I swear I saw two dorsal fins. They were huge! I got all excited because I thought they were orcas! So I yelled at Romy, "Orcas, orcas!" and he looked at me all crazy. Then I grabbed the camera and ran to the water. Once I got a better look, I realized they were actually two dolphins! They were jumping in and out of the water as they swam along the shore, and they were really close to the shore. I tried to take a picture but only got one where a dorsal fin is sticking out of the water. They swam around the surfer, who I don't think noticed them at all. It was really exciting to see dolphins in their natural environment, not at a zoo! Soon the sun was so low in the sky that it was starting to get chilly. So we decided to pack up and head home. 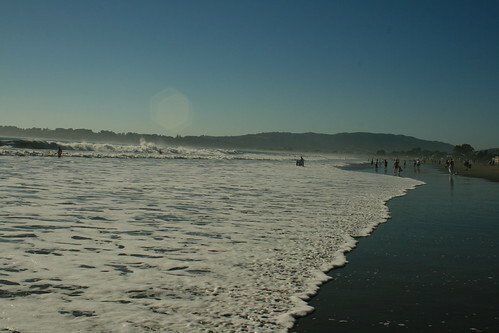 My famly is going to Stinson Beach in one week and we are very exited!